Protection, support, movement, mineral storage, and blood cell production are all functions of bone. Of the four basic tissue types (epithelium, connective tissue, muscle and nervous tissue), connective tissue is the most diverse. Bone is a type of connective tissue. Histology hint from Sarah Bellham: Keep in mind that the word "bone" can refer to either a type of tissue or to the organ. As a tissue, bone tissue is a type of connective tissue. When referring to a bone (the organ), there will be several types of tissue present. The process of bone formation is called osteogenesis. An osteoblast is an immature bone cell. The osteoblast is the bone forming cell. A bone lining cell is a resting osteoblast. The mature bone cell is called an osteocyte. An osteocyte rests in a space called a lacuna (a lacuna is a small space or depression). An osteoclast is a multinucleated cell involved in the degradation of bone. It is a bone resorbing cell. 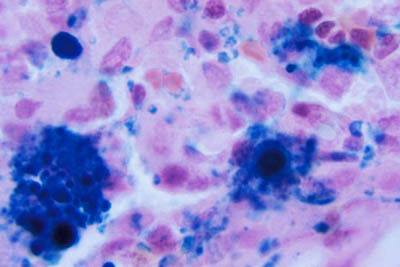 Howship's lacuna is a space seen underneath an osteoclast. Compact bone is also called dense bone. Compact bone is composed of closely packed osteons. 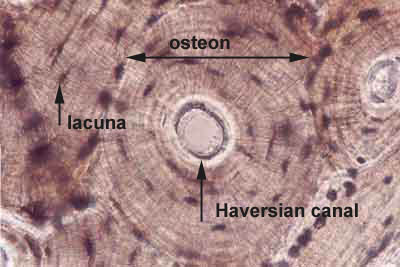 An osteon is also called a Haversian system. An osteon is the cylindrical structure with bone. Spongy bone is also referred to as cancellous bone. The mineralized tissue is seen as spicules. Trabeculae are the spicules seen with spongy bone. Marrow spaces are also present. Immature bone is woven bone. It is nonlamellar bone or bundle bone. Calcium is in a mineral structure in bone and tooth enamel called hydroxyapatite. The chemical formula is [Ca10 (PO4)6(OH)2] The matrix of bone is mineralized. Within the matrix are collagen fibers and proteoglycans. Sharpey's fibers are collagen fibers that extend into a bone at an angle. Canaliculi are the little tunnels within bone. Osteoid is unmineralized bone matrix. The periosteum is the connective tissue covering of a bone. The endosteum is the lining of the inner bone (the side which abuts the medullary cavity). Histology hint from Sarah Bellham: The prefix "peri" means around, such as in the word "perimeter". The prefix "endo" means within or inner, such as in "endosteum", "endocrine", "endoscope". Red marrow contains active hematopoietic tissue. Yellow marrow is primarily fat. Intramembranous bone formation is the mechanism of bone formation whereby bone is formed without a cartilage template. In intramembranous bone formation, connective tissue membranes are replaced by bone. This process takes place in the flat bones of the skull. Endochondral bone formation is the process of bone formation where the bone is formed using a cartilage template. Hyaline cartilage forms the skeleton of the fetus. The cartilage forms a template of the bones. In endochondral ossification, bone tissue replaces the hyaline cartilage template. Endochondral ossification occurs during the childhood, replacing the hyaline cartilage with bone. Most bones are formed by this mechanism. Bones grow in length at the epiphyseal plate. The epiphyseal plate is between the diaphysis and the epiphysis. Bones no longer increase in length after the epiphyseal plate completely ossifies. Bones are classified as short, long, flat, or irregular. The diaphysis of a long bone is the central shaft. There is an epiphysis at each end of the diaphysis.